The answer is a big Yes – serving chicken liver to your cat sounds ok since it is entirely safe for them. In fact, it is quite palatable to almost all cats, and they might fall in love with its taste. Chicken livers contain a number of nutrients that are essential for the proper development of cats. It has considerable amounts of iron, vitamins A, B & C, folic acid, among others. Thus, it is especially suitable for anemic cats (since anemia is a deficiency disease of iron and Vit. B). Moreover, it has a compound called taurine (an amino-sulfonic acid) that carries out some regulatory functions in mammals. The liver is the organ where a high amount of vitamin A is stored. So, lots of liver in your cat’s everyday diet might not be right for them since there might be a risk of vitamin A toxicosis. Serve them chicken liver not more than 2 to 4 times a week, and let it not constitute more than 5% of their diet. Though liver has many health benefits, it is not nutritionally balanced or wholesome. So, make sure your cat doesn’t get addicted to it. You can give chicken liver to cats in their meals or as treats in many forms including cooked chicken liver, chicken liver-infused cat foods (regular or hydrolyzed), chicken liver powder, and so on. 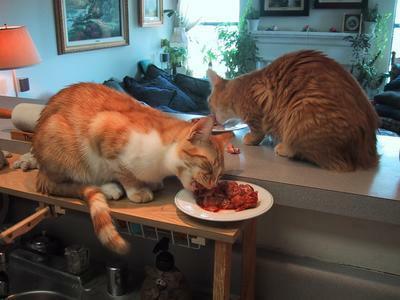 Cats can also feed raw chicken liver since they can then get the maximum benefit from it. For that, you can cut the liver into small bite-size pieces, or pate it finely in case of kittens. Boiled: Dice the liver into small pieces and simmer it in water for about 10 minutes, along with a few pinches of salt. Wait until cool, and then serve the liver in its feeding bowl along with a little amount of water. Steamed: You can also use your steamer for about 15 minutes until tender, and serve it to your pet. Baked: Arrange the liver pieces in a baking dish lined with baking paper. Now place the dish in the oven, preheated to 180°-200°C. Let it bake for about 15-20 minutes before giving it to your cat. Published on January 8th 2018 by admin under . Article was last reviewed on 8th January 2018.